We have a brief pit stop in Cairns before our flight back down to Brisbane and end up on the national news. 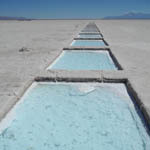 Salinas Grandes. Snow White and the 7 coloured rocks. As far as spectacles, the Salinas Grandes comes pretty close to Iguazu, but is almost completely free of tourists. This may have something to do with the fact that it is over 4000m (at 13,000 feet), or that it is pretty remote, either way, having the place nearly to yourself is very cool.